Des' fiancee Joan gets back together with her former husband. Max gets a letter from an old schoolfriend. Terry tells Paul that they should postpone their own wedding. 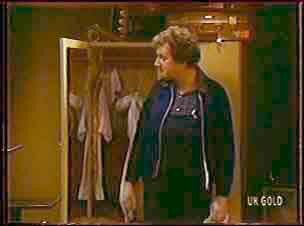 Maria is cooking and humming to herself when Danny comes in. 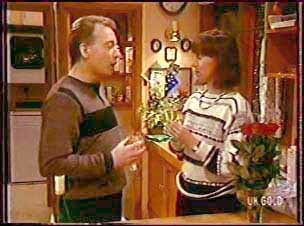 Maria tells Danny that Richard is coming round. He isn't pleased, but Maria isn't taking any nonsense from him. Maria gives Danny $10 to go out this evening. Danny protests that they can't afford $10 but Maria says that it's worth it for a bit of peace! Scott is studying while Danny paces, moaning about Richard. Danny thinks Richard is weird and has changed Maria, not for the better! 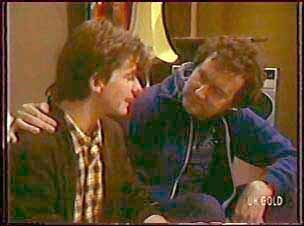 DANNY: All I get is conscience money. He gets chicken casserole! Danny says that Maria is still married - she's not even divorced, and Max doesn't go round with other women. Danny thinks he'll tell Max about Richard in the hope of making him jealous enough to come back. DANNY: I'd rather have Mad Max for a father than Morrison. He resolves to go round and see Max. Danny calls round, snapping Max out of his reverie. Max asks what the reason for the visit is. Danny says that he's had $10 worth of a blue with Maria. 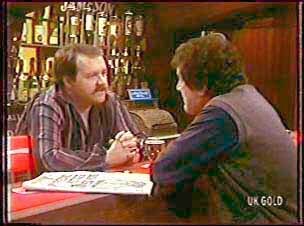 Danny tells Max about Richard Morrison - he's tried to get rid of him but failed. Max says that Danny has to face the fact that he and Maria might never get back together again. He and Maria have different lives now and Danny has to get used to that. Danny asks Max to come back. He sympathises, saying that he feels sad about Maria seeing other men, but the divorce is still going ahead. MAX: You'll get used to it. Just like I had to do. Danny invites Max to the movies, but he has something on tonight. He says he'll come another night. Max watches him go a bit sadly. Then he takes out Amy's letter again and calls her from the payphone. 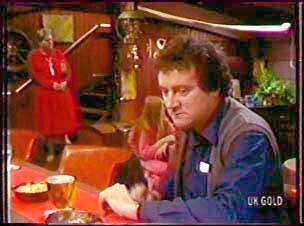 He makes arrangements to meet up with her tonight in a restaurant called "Smuggler's". She says she'll wear a red silk dress so Max will recognise her after all this time. 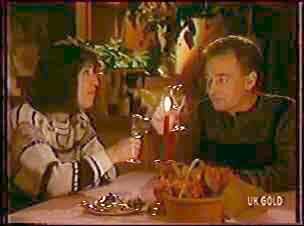 Richard and Maria are having a glass of wine as Maria finishes off cooking the casserole. They talk about Danny's lack of approval, and his relationship with Max. Maria says that Max doesn't like Danny very much - they rub each other up the wrong way. Richard says he'll try not to make the same mistakes as Max with Danny. Max has arrived at the pub and chats to the barman about Russian foreign policy and nuclear war. He thinks everyone should just say, "I forgive you" and go on from there. 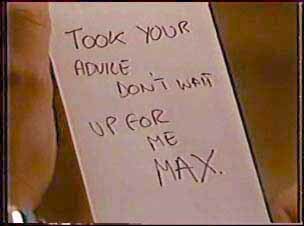 Shane arrives back to find a note from Max saying he's gone out with Amy. SHANE: Amy. Good on you, Dad! Max is still waiting for Amy and chatting to the barman. Now the barman is saying that love drives everyone mad. Just then a woman in a red silk dress comes in and she's quite a big girl. Max hides behind his newspaper and creeps out of the restaurant! My jaw is dropped! Max gets home in a bit of a strop. He sits down sadly on the bed and looks at Amy's letter again. Then he crumples it up. 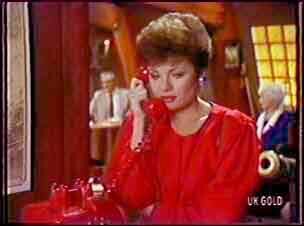 Another woman in a red silk dress comes in - this must be the real Amy! She tells the barman that she's waiting for Max Ramsay. The man says that Max was there, but he took off. Amy goes to phone Max. Max answers the payphone to Amy. Amy offers to pick Max up from his place, but he tells her he's a bit tired and then fobs her off, saying he's going overseas(!) Amy slams the phone down. Max and Richard are having a candlelight chat at the table about their kids. Richard asks Maria for tips that will get him onside with Danny. Maria says Danny likes girls, mostly(!) Sometimes he plays squash. Also Max used to train him in diving. Or bike riding or rock music. Richard has a think and says he could teach Danny to drive. Maria thinks that's a great idea. The light is on and so is the record player. Daphne realises that someone has been in the house. Shane suggests that the house is haunted(!) Daphne asks Shane to check upstairs, just in case. She goes to the back door and it's locked. Back in the living room she checks all the windows. Shane comes back and says there's nothing upstairs. He says Daphne must have been mistaken about the radio and the light. He heads off. Maria is feeling guilty about sending Danny out. She hopes that Danny will come round to Richard being there. RICHARD: Maria. I think I'm in love with you. He wants to know if Maria loves him back. Maria says that it seems to her sometimes that what she feels isn't important. But if it weren't for Danny, she'd be in love with Richard. Richard asks what she'll do if Danny continues to disapprove. Maria doesn't know, but Richard says she'll have to face it one day.